The Colors of Blue was very compelling in many ways but the main character's gift of seeing colors could have been more developed or a central part of the story. The fact that it wasn't took away from what could have been a wonderful romantic story. I just didn't see the point of it except that it created a tenuous link between Sara and some of the other characters but I felt like there were other points in common that could just as easily have created a connection between them. I did really enjoy the descriptions that the author was able to write about this unfamiliar region of the United States. I found that this was a true strength and you could definitely tell that he truly does love this region of the world and the natural beauty of it shines through in the words he chose. 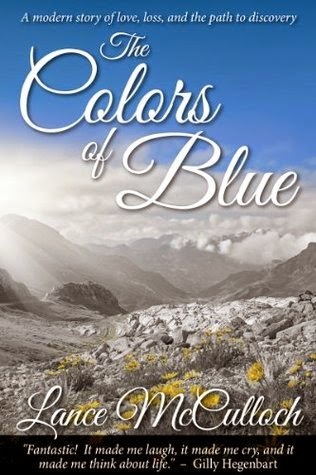 The pacing of The Colors of Blue was a bit off as I found it more quickly paced at the beginning and then it began to drag out once the love interest was unofficially declared. It was a little too sweet of a love story to be believed but then again sometimes stories like that are a wonderful distraction from real life. I would definitely recommend this book for someone who loves a great romance and is more of a country than city person.